Brexit is a sideshow and distraction. Clearly the EU as a monolithic, bureaucratic institution that is increasingly focused on implementing anti-spiritual liberal projects is a bad thing and a softer example of the sort of thing that England has rescued Europe from in the past from Phillip II to Napoleon to Hitler. But Brexit has no cohesive sense of what it is and is just as materialistic and secular as Europe so nothing good can be expected of it. Any would-be solution to the current impasse will just end up fostering division and hatred. Don’t look for any worldly remedy to our current spiritual crisis, certainly not from politics. The spiritual person has to stand aside from all of this and just seek to develop an ever-deeper awareness of God. As for the English people, there's not much of them left anymore, not in any number to be reckoned with. There's no sleeping giant that will stir when a crisis arrives. We are too deeply corrupted and separated from our roots for that. But individuals can, as always, work out their own salvation. I don't think this is pessimism. It's just how things are now. Terry Boardman's analysis of "The Wounded Cavalier" painting is one of my favourites. I often go back to it and relish the imagery and his wonderful exposition. What is interesting to me is that the rulers ever even began the Brexit negotiations - despite being told by the entirety of the Establishment chattering classes in the UK and Europe that they could and should just ignore the referendum result. This could mean that they really are worried that doing nothing would stir Chesterton's 'secret people'; or it could mean that they are playing the Brexit situation to maximise fear, resentment, envy, spite etc. Sometimes, and perhaps more often than all but the most foundational (and radical) teachers of Christianity tell us, working out our individual salvation means confessing that we owe allegiance to God rather than Caesar, and thus effectively taking up our cross and following Christ's path to torture and execution at the hands of the State. Brexit may indeed be an entirely negative conception, rejection of a particularly corrupt human authority rather than any coherent positive vision of what should replace it. But that rejection may be the absolute minimum requirement to follow Christ. It may be that nothing will come of it from a worldly perspective. Christ died on the cross and did nothing to directly overthrow the government that put Him to death even when He came back from the dead. You could call that a failure, and both the Romans and the leaders of the Jews did mock it as such for a long time. But Christians continued to confess that they would rather die for testifying of Christ than live by lying to themselves. @CCL - I agree, I think. It is the positive desire to embrace the European Union that is the deep spiritual problem. Rejecting the EU is just basic spiritual hygeine - if you can't see its evil nature (after decades of experience), then you are (now or soon) part of its evil nature. Basic spiritual hygiene is a wonderful way of putting it. The best description of Brexit yet! I'd put basic spiritual hygiene more as not actively seeking to base your life and livelihood on being an agent of evil. Brexit (as all cases of ordinary people having to overthrow a government) is more emergency sanitation. There have been times and places in the world when the rulers were doing the best that mortal men could (though of course that best was never perfect). Would that we lived in a time and place with such government and could thus devote ourselves to strictly private religious duty, but we don't. Nor shall we ever unless we resist the extraordinary evil of our day. I'm bored with Brexit but really appreciate having that painting drawn to my attention! @William - It's quite something isn't it! What *makes* the painting for me - apart from some nice Pre-Raphaelite style painting - is the young puritan man lurking behind; his startling and enigmatic expression. 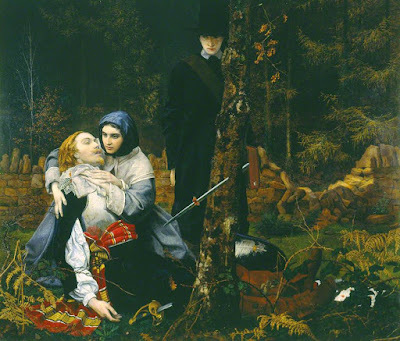 This raises its interest above the usual PR themes, which tend to be rather straightforward - an exception being Millais's Ophelia, which I probably regard as the greatest of the genre. If you do not mind, I am going to copy what you wrote and refer to it often. @William - Incidentally, while this is a very good picture, the puritan man does seem worse painted than the rest (it's hard to tell from a reproduction) - he seems a bit blurry in the face, and right hand, as if overpainted or redone. There is also the strange distortions in perspective - or depth, here and there (eg the left and right sides of the tree trunk seem to inhabit different planes - so the tree isn't securely located in space); a things which quite often happened with the PR painters - probably due to the extreme detail with which small things were painted. Then there is the fact that this was the only painting by this artist which is regarded as exceptionally good. Put it all together; and it may be that there was something of an accident - a happy accident - about why this painting turned-out to be so fascinating. The Puritan looks to be an aberration, a kind of not-quite human man. He's lacking the spark that marks a spiritual person. He represents what we have become. He is the beginning of our journey down the wrong path.